Let's say your a geek and you're traveling the country in your 30 year old Airstream trailer and you have a bunch of data you'd like to share with other fellow digital nomads (oh wait, that's me). Data like how much money you've spent on gas and campground fees, the number of days you've been on the road and the states you've traveled to. Wouldn't it be cool to do that with Power BI...for free? Well you can and it's pretty easy. In this post I'll walk you through the steps necessary for "embedding" your Power BI reports in any web page/web site. There are a couple of things we need to do to make this magic possible. Download Power BI Desktop. 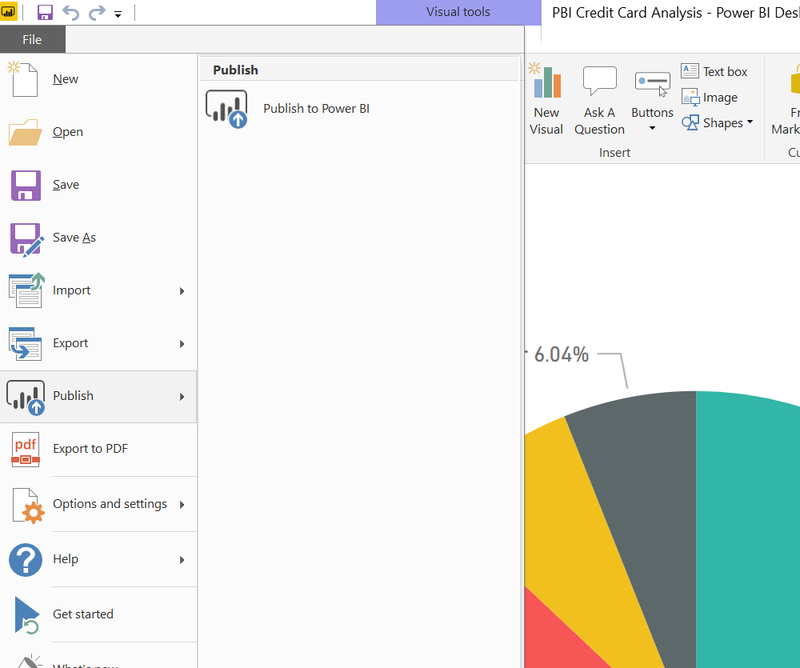 You're going to need something to author and publish your Power BI reports with. That's Power BI Desktop which can be downloaded here. Create a Power BI account. This account will allow you to publish your reports to the web, from where your web page will display them. Create a Power BI report that you'd like to share with the world. Now that you have the proper tools and accounts and have created a deeply insightful report, it's time to publish your report to web. Publishing your report puts it on the Power BI servers and makes it available to share with your millions of adoring fans. 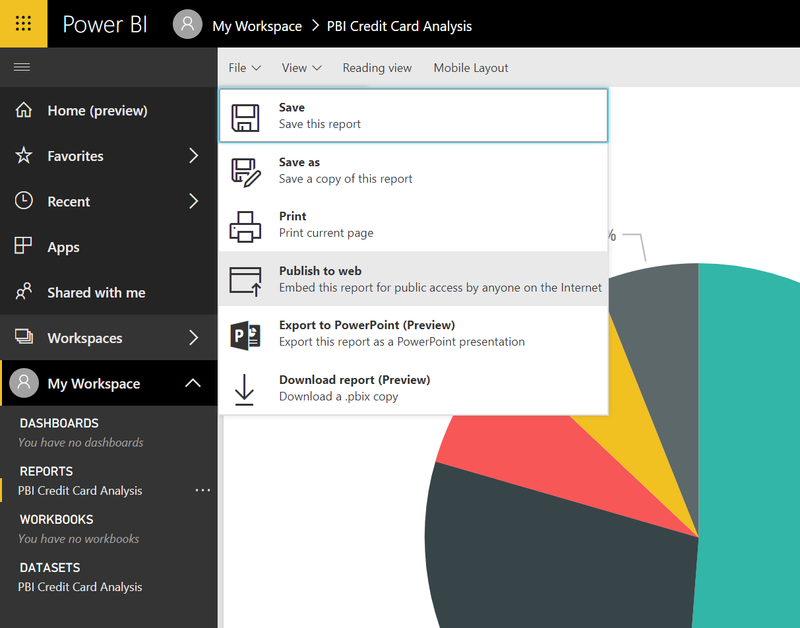 If you haven't already, open your Power BI report in Power BI Desktop. Navigate to File -> Publish -> Publish to Power BI. Choose your workspace and publish. Now that you've published your report to Power BI it is available for you to "embed" in your web page. I have been putting "embed" in double quotes because Microsoft uses this term for another, more feature-rich (and not free) approach to sharing Power BI reports that we're not going to get into here. The approach we're going to use here simply uses an iframe to expose your Power BI hosted report in your own web page. Open your report on the Power BI website. Navigate to File -> Publish to Web. Paste the embed code into your web page. Start spinning up that HDFS cluster to handle all the web log data that will be coming in now that your website has fancy shmancy reporting for all the world to see ... for free (the reporting, not the hdfs). Delivering bulletproof, data-centric software solutions to organizations such as Disney, PwC, Cymer, Boston Scientific, the Pittsburgh Steelers, Blue Cross Blue Shield of Massachusetts, Irving Oil, Bain Capital, LoJack, PETCO, and State Street Bank for over 14 years. Driven by a passion for problem solving, technology, and profitability. Information Collaboration LLC. Simple theme. Powered by Blogger.